If you just realized that your true passion is acting, congratulations! If this is what you’re meant to do, there’s nothing more rewarding. But you might be a little overwhelmed! Where do you begin? You’re ready to commit 110 percent, and our Backstage Experts want to help you. What is the very first thing a new actor should do? Putting their answers together, here are the first 15 things new actors should do upon choosing this career! I think that all new actors should get enrolled in acting class to improve their skill and see if they even like acting. A classroom setting is a safe place to explore your talents, learn your strengths and weaknesses, and begin forming who you are as an actor. Train. Make work. Train some more. There is a feeling of urgency—sometimes even desperation—that actors have no matter where you are in your career. It happens at the very beginning;it happens right out of a conservatory program; it happens upon arriving in L.A. or NYC or Chicago. It happens after a few years at it, and it happens 10 years in…and so on. But what is constant is that you have to be training as often as you can, however you can. Focusing on the work is what is most important—not your headshots or getting an agent. Focus on living the life of an actor. In class, doing theater, writing and shooting and making work. You have to be working your actor muscles, and the only way to do that is by acting. Then you’re truly an actor, not someone waiting to be called an actor. If you’re in and of the work, the industry will find you. The No. 1 step for new actors is to get training. Actors need to understand how to work as a professional, and they need to understand the business of working in the industry. Imagine applying for a job in any industry without the proper training/qualifications? Could you get hired? Could you keep your job on raw talent alone? The first step is to find a teacher that you feel you can learn from. There are many options available. Be sure and sit in on a class for free. It’s called an audit. The purpose of the audit is to find the teacher/class that feels right to you. What many people don't realize is that to work in film/television takes training, hard work, and knowledge of what to do when you get an opportunity. If you’re lucky enough to book a job without training, find a coach quick so you don’t make newbie mistakes on set that could harm your reputation. Your training should include script analysis, audition technique, set etiquette, and other skills. The very first thing an actor should do before starting out is to name the one job they would do if they could choose only one. Actors think they improve their chances by being open to everything when in fact, the opposite is true. Get clear and specific about what you want and you can be clear and specific about what to do to get it. 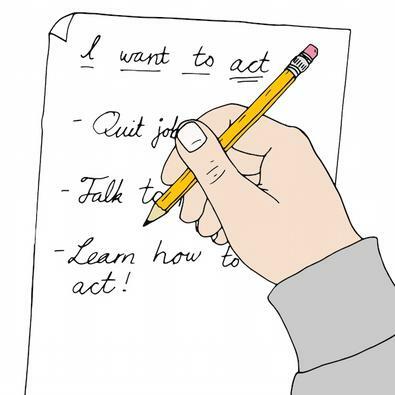 First and foremost on a new—or any—actor’s to-do list should be education. Take classes, read scripts, explore industry sites, know who the movers and shakers are in the biz, attend theater, watch TV and film, see and try improv, have impassioned chats with fellow artists, network, try to maintain a healthy mind and body, and say yes to as many audition invitations as you can. Each one is a learning experience that will shape you. Basically, flex the brain and body and heart and never think you’re fully grown. A lot else depends on Lady Luck. So you’ve decided you want to be an actor. Now what? Well, for now, resist the urge to spend money. There are plenty of people who will be happy to take it but, before you run out and get pictures taken or sign up for an acting class, think it through. Why do you want to be an actor? Do you crave attention? Do you want to become rich and famous? Is it because walking the red carpet seems so glamorous? Examine your motivation to be sure you want it for the right reasons. Next, get educated. Research the industry. Learn what professional actors do. How much do they earn on average? What type of acting do you want to do and what opportunities are there? Be sure the work, lifestyle, and sacrifices you’ll likely have to make are something you’re willing to commit to. If you still want to be an actor, then find a coach or class to learn if you have what it takes to turn your desire into a career! Once you have determined that you want to act, train, train, train. This is a craft. It takes talent, passion, and hard work. You wouldn’t become a lawyer without going to a great school. Good actors make it look effortless, but the skills and techniques they work hard to hone are what make it possible to appear as though they’re not acting. And, of course, make sure you love it so much that you can hold up to the tough life of an actor. If you love it enough, it is not work but fulfillment. In my beginner acting class, I make sure you step into your true purpose in life so that it feeds your acting, too! The first thing a new actor should do is start acting! Then, I’d suggest visiting NameCheckr.com to see if their name is available online. The goal is to be 100 percent consistent—YourName.com, YourName@gmail.com or You@YourName.com, and @YourName on all social media. This way, it’s super easy for friends, fans, and industry contacts to find and connect with you. If your name is already taken (and it happens...including to me), here are six creative ideas. As an actor myself, I’ll agree with the other advice on this page (and I’m pre-writing this without seeing the other experts’ responses). You need the classes, the books, the photos, etc. However, do not forget about controlling what people find when they Google you! That is part of your first and ongoing impression. You have the ability to shape your career and reputation with your online presence—presenting your best self 24/7 around the world. Your Google results can be working as your best agent, best audition, or best first date! Social media allows you to connect with anyone and everyone. Absolutely get started in acting by training and getting great photos... but don’t forget to invest just as much time, money and energy into your online presence. It’s your virtual representation! You want to be actor! The first thing you should do is get into an acting class. There are several types of classes: scene study, improvisation, commercial, musical theater, on-camera, etc. It doesn't matter what type of class it is, just take a class! Being in a class teaches you about preparation and making choices. It will help you get comfortable performing in front of other people. Working with and watching other students perform is also an invaluable learning experience. In improvisation classes you learn how to create ideas quickly, to listen, and react to what another person is saying or doing. Improv helps to keep you in the moment and is a lot of fun. With a commercial class, you learn about being in front of a camera and practice how to “sell” a product. This also enables you to show your unique personality and shine in front of a camera. Classes teach you different techniques and skills. Most importantly, they give you valuable practice. The more you practice, the more confidence you will gain! Tenacity and training are essential throughout your career, and absolutely imperative from the very onset of your career. Without it, so-called “natural” talent is random, often misguided, and unreliable. To add to this, not understanding what is needed and wanted of you during an audition, on a set, and throughout any given production makes it nearly impossible for you to offer valuable performance options take after take. Therefore, proper coaching will test (and determine) your tenacity, build your skill and confidence, and allow you to have a greater insight as to how you can improve every production you may find yourself cast in. Instead, far too many talent replace proper training with asking other actors what to do. This could easily be a key contributing factor to the steep failure rate among actors. The fact is, proper training is an ongoing process because industry demands, like you, will continue to evolve. Besides, your ability to stay in step defines your willingness to work. And continually working your performance muscle will keep it from atrophy. In my professional opinion as a casting director and coach, the first thing you must do after deciding to be an actor is ask yourself why you want to become an actor! I am very serious about this. You must dig deep to find the true motivating factors. Acting is the most competitive business on the planet! Everyone wants to be famous. So you must ask yourself: What do I want here? Is this for fame ? Is this for money? Is this my true all-consuming passion? The life of an actor is filled with many more no’s than yes’s, so ask yourself why you are doing it, understand the road ahead, and pursue it with a passion and fury second to none. Leap and the net will appear! I may be biased, but the very first thing an actor should do is get into a class. You wouldn’t decide to open up a furniture shop before learning how to build a table, would you? Find a studio that challenges you, that emphasizes listening above all else, and has a true sense of community. The people you study alongside will become your first professional network, support system, and circle of friends. Surround yourself with like-minded artists who are moving in the same direction as you, who are dedicated to their craft and to the industry, and together you will begin to make your own path. Be a sponge. Get into class. Something has lit a passion inside of you and now is the time to kindle it. Feed your creativity and get the artistic juices flowing by learning the skill and technique of acting. I suggest a scene study class where you’re being taught the skill of dissecting the script to follow the writer’s intention (text analysis). When you’re not in class, read all the acting books you can get your hands on. Hone your taste level by seeing excellent acting performances on stage and screen. Later you can dig deep in classes of different genres: Alexander technique, voice class, Feldenkrais, movement, musical theater, on-camera, etc. Sit down with your actor friends and learn their stories, their challenges, and their successes so you’ve got some vision of what’s to come. And celebrate your courage for naming the big dream (I suggest a mani-pedi, massage, a Broadway show..or all three!). The first thing every new actor should do is to assess whether you truly love acting. Ask yourself if you have a passion for the process of breaking down text and constructing a character, or whether you’re just doing it to win some kind of perverse lottery. I have many clients who truly love the craft and process of acting. These are actors who will perform to audiences of six, and will accept one-line roles in student projects and thank the director genuinely for the opportunity. Then, there are actors who refuse to audition for small parts because they have it stuck in their heads that being a star is their top priority. Grandstanding is their only concern. Money and fame are always the most important goals for these types, and it trumps everything else for them. If you’re new to acting, I invite you to thoughtfully consider which type of actor you are, and examine whether or not you truly love acting before throwing yourself into the thorny field of this industry. Read more to see which category you fall into: here. The very first thing you should do is call Martin Scorsese and tell him you’ve decided to be an actor and that you are available to star in his next film! Preferably as the romantic lead opposite Leo DiCaprio! Then I would Google “acting classes in _____” (your area), find some local classes, check out the class and teacher reviews on Yelp, and sign up for classes immediately. Your journey begins with training. As actors, we always feel like we can do it all, but trust me when I tell you focusing in one area at a time will be a lot smarter, time efficient, and cheaper to pursue. Having said that, narrow down which area you fell most compelled to pursue. Do you want to do only commercials? Be a voice actor? Guest spots on television? Feature films? Animation? The list is endless, but find one lane, concentrate, and perfect it before moving on to another. Get into class! The learning curve and honing your craft never ends! Remember, you can always learn something new if you remain open and honest. Being in class will assist you in staying prepared. My mom always says that luck = preparation + opportunity. If you stay prepared for the opportunity, luck will find its way to you. As the owner of A Class Act NY, the award-winning acting studio for kids and teens, I see green actors every single day. I know that the first step to success for these kids is quality training. Find a highly regarded acting class and work hard at learning the craft. A bad acting class can often do more harm than good. Young actors often come to me way too showy and over the top, often because that’s what they learned in other acting classes, or that’s how it worked in their school play. If new actors are serious about getting representation and working in the business, they need to get serious training first. To find a quality acting program, read reviews of the teacher’s page on Facebook or anywhere where real clients and customers can rate their experience. Make sure the studio has a page where you can see students and alumni success stories. Nothing speaks better to the quality of a program than the success of its students. Get very clear on the “why.” Why do you want to be an actor? What is it that draws you to this profession? What do you want to create in the world? Having a very clear “why” will motivate you to succeed and keep you going during challenging times. The number one thing I would do if I decided I wanted to be an actor was begin extensive actor training and, of course, get headshots from a reputable photographer. Headshots and a good photographer are not only important for providing you with your calling card, aka the headshots, but also understanding your inherent marketability. Knowing this marketability will help guide your training. I believe that you should be impeccable at roles that show your general vibe and how casting directors will inherently read you. And yes, you are going to want headshots that get you through the door, but you better be able to bring your A game once you are there! Once you’ve made the decision to become an actor, your first step should be fairly obvious: Start your training. However, that being said, it’s never too early to start learning about the business you’ll be in. By expanding your knowledge of it—discovering information about what is expected of you and what you can expect from it—will prepare you for the road ahead. To get this information, the best place to start is with who you know. Talk to friends and acquaintances. Who do you know and whom might they know? Find a mentor—someone knowledgeable about the business who understands your goals and is willing to guide you. Network with other actors through classes, support groups, or online forums. Attend industry events. You might even explore doing an internship with casting or a production company. The more you learn, the more you’ll see other areas that you’ll want or need to explore. And the more you know the business, the greater your likelihood of success in it. Find a mentor. Find another actor who is making a living acting and ask them to mentor you. Don’t ask an actor who isn’t making a living, no matter how many acting classes that person has taken or how many non-paying plays they’ve done, or web series, or student films, or non-paying shorts and non-paying features. There are a lot of those people. Find someone who is making a living at it, at least somewhat. Anyone who is being paid to do what you want to be paid to do probably has advice more valuable to you than the myriad of opinions you will receive for every question you ask. have to find the right class to break into film. Most of the training out there is built on false assumptions when it comes to the cinematic style. So be careful. A bad class can ruin you. The fist class you join will likely define your success for years to come. Have a question? Message us on Facebook or tweet @Backstage. Want to be more involved in the Backstage community? Become a subscriber here!